We are proud to showcase our CONTAINED trilogy of performances on migration: Decisions and Journeys // Arrival and Reception // Movement and Change. 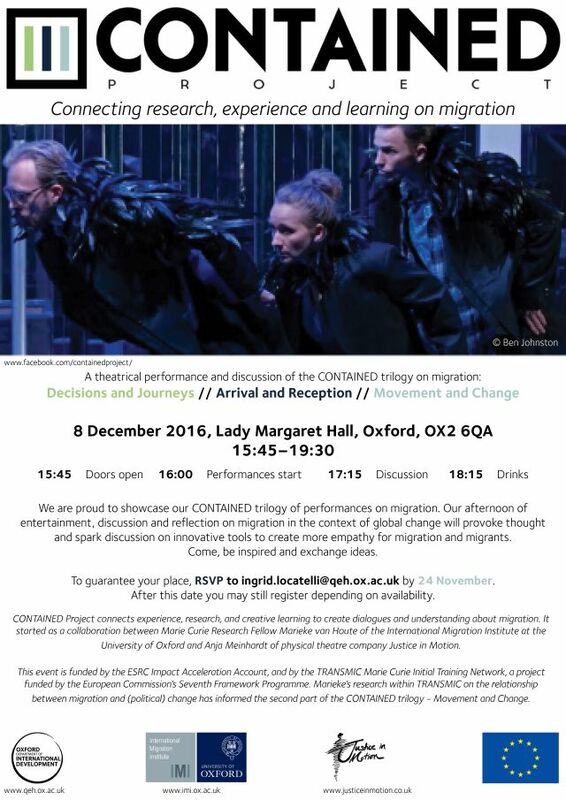 Our afternoon of entertainment, discussion and reflection on migration in the context of global change will provoke thought and spark discussion on innovative tools to create more empathy for migration and migrants. Come, be inspired and exchange ideas. To guarantee your place, RSVP to ingrid.locatelli@qeh.ox.ac.uk by 24 November 2016. CONTAINED Project connects experience, research, and creative learning to create dialogues and understanding about migration. It began as a collaboration between IMI's Marie Curie Research Fellow Marieke van Houte and Anja Meinhardt of physical theatre company Justice in Motion. This event is funded by the ESRC Impact Acceleration Account, and by the TRANSMIC Marie Curie Initial Training Network, a project funded by the European Commission’s Seventh Framework Programme. Marieke’s research within TRANSMIC on the relationship between migration and (political) change has informed the second part of the CONTAINED trilogy - Movement and Change.